As the next step in IDEA's continuing commitment to green initiatives on school grounds, we will host a community event this spring to help build our new Living Classroom. The Living Classroom will provide a variety of educational and environmental opportunities for IDEA scholars, teachers, and the wider community. 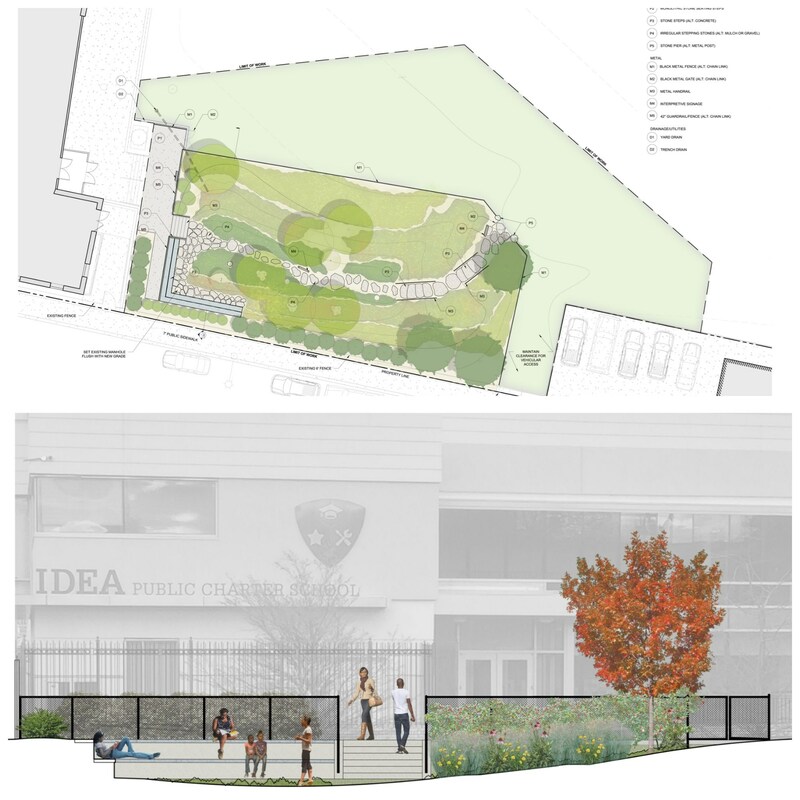 During our expansion in 2012, IDEA built a bio-retention pond on campus which naturally breaks down potential river pollutants in rainwater and uses an underground detention system prior to releasing water to the DC stormwater system. The Living Classroom will be built on the site of the bio-retention pond. The IDEA campus is situated in an environmentally sensitive location in the Nash Run watershed, within walking distance of both Watts Branch Creek and the Anacostia River, each of which is a high-priority protected area for the DC Department of Energy and Environment. IDEA's ongoing green initiatives integrate environmental stewardship and technological innovation into our math, science, architecture, and vocational curricula and enables IDEA to serve as a leader in our neighborhood on environmentally sustainable architecture and lifestyles. December 15, 2016--IDEA will grow even greener in 2017, thanks to a recent RiverSmart Schools grant from the DC Department of Energy and Environment. Funding from the grant will enable IDEA to transform the asphalt parking lot and alley into an eco-friendly area, including green space where we can plant more kitchen gardens and fruit trees. DC Students Construction Trade Foundation partners have agreed to demolish the asphalt at no cost to IDEA, and we will replace some of the surface with permeable tiles that prevent stormwater run-off that damages the Anacostia River. Casey Trees, which has collaborated before with IDEA's Green Club, has agreed to donate and help plant trees in the new green space. Benefits of the grant will multiply for the school and community, as the new projects will improve the school environment, involve students in designing and building the new space, decrease the amount of IDEA's water bill so that money can be used for student projects, and ultimately help protect the Anacostia Watershed. 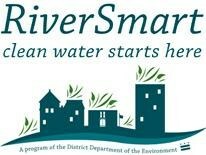 Click here to learn more about the RiverSmart Schools initiative. 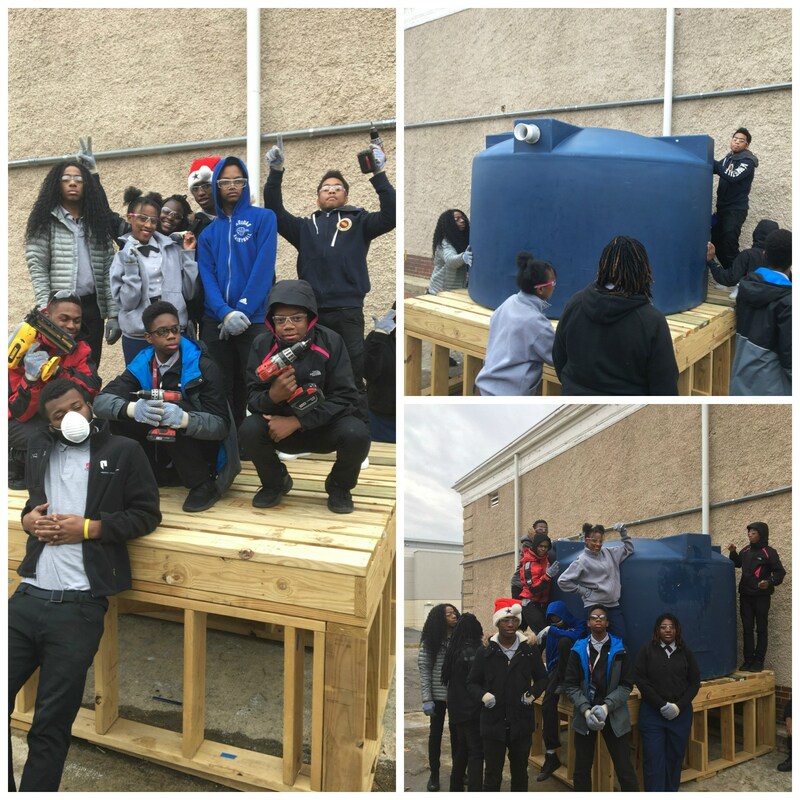 December 15, 2016--After building the base in construction class, Academy of Construction and Design students installed a 1,500-gallon cistern outside the school building to collect rainwater. The cistern will serve two purposes: use the rainwater to irrigate the gardens that students have created and maintain to feed students and the community, and divert stormwater run-off that pollutes the Anacostia River.